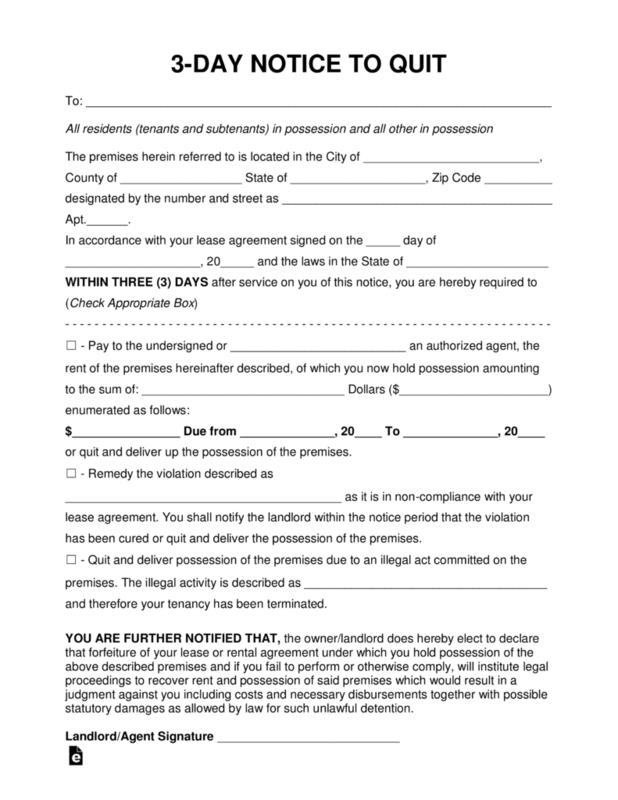 The 3-day eviction notice template is used by landlords to inform a tenant that they are in violation of their lease agreement. The document may be given for any type infraction, most commonly being the non-payment of their rent, but could be for any type of non-compliance such as sound complaints, damage to the premises, pets on the property, occupancy by guests, and any other types. The tenant will have the option to either cure the issue or vacate the premises within the notice period. After downloading the landlord or agent will want to make sure that the form is in accordance with the laws in their State and they may begin to fill-in the document. Step 1 – In the first paragraph the landlord will want to fill-in the information of the tenant (name), property address, date of original lease agreement, and the State where the residence is located. Non-Payment of rent – Include the amount that is past due along with any penalties/fees. This must be the total amount as required by the tenant for their rental contract to be in good-standing. Violation (Curable) – Describe the violation that the tenant the tenant committed. They shall have the notice period to correct the issue and elect to have the landlord view the cured issue. Notice to Quit – If the tenant broke their lease by committing an illegal act such as having drugs, gang activity, or breaking the law in any other type of way the lease shall be terminated immediately. The tenant shall have three (3) days to move-out. 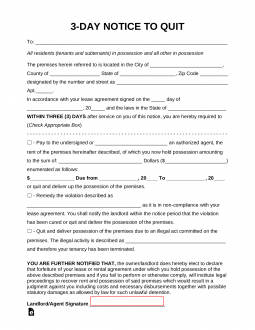 Step 3 – At the bottom of the page the landlord or agent should sign the form and then proceed onto Page 2 for the Certificate of Service. First-Class mail addressed to the tenant. Although it is highly recommended that Certified Mail should be used even though First-Class is valid. The notice has been successfully given to the tenant and the three (3) day notice may commence.